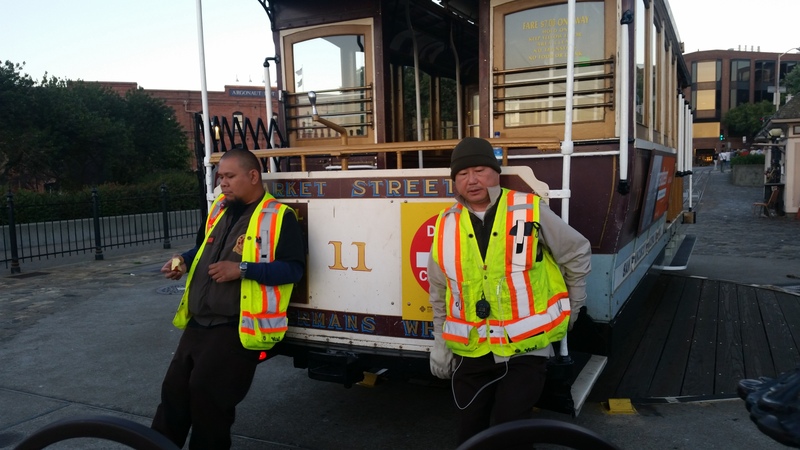 Every time I have visited San Francisco I watch the Trolleys pass me on the streets with passengers waving and hanging on as they go up and down the steep hills of the city. I always wanted to jump on one, but time never cooperated. This year, riding one of those cars was my goal. 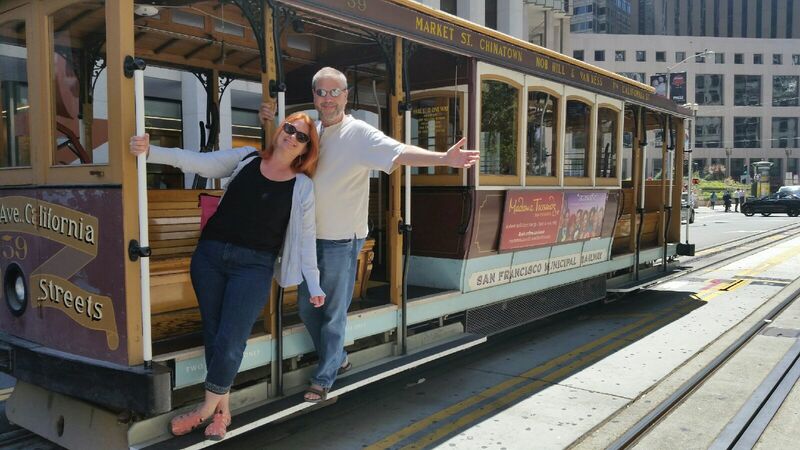 I booked our stay at the Omni San Francisco, a beautiful hotel right on the route and purchased the cable car package through the hotel. After a few short stops, the conductor announced it was the end of the line, and at the end of the line everyone gets off. 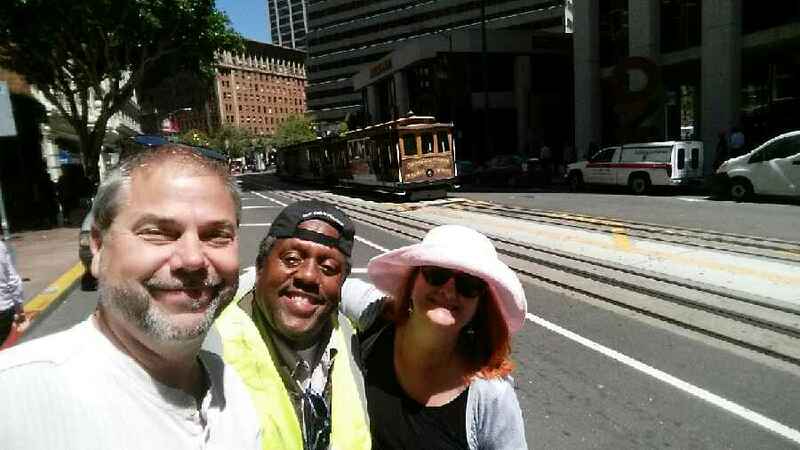 I guess I verbalized my disappointment a little too loudly because out of nowhere, appeared Lance, a grip man who seemed determined to make sure I got the cable car experience I had come to San Francisco for. Catch the Cable Car at the start of the line, you may have to wait a little longer but you will get one of those coveted outside spots, I did not realize those were premium spots, I thought cable cars were a primary form of transportation and the outside polls were for the poor unfortunates who were last on, I was banking on being one of those poor unfortunates. When I watched Streets of San Francisco or Ricearoni commercials the guys outside always had briefcases and wore business suits. 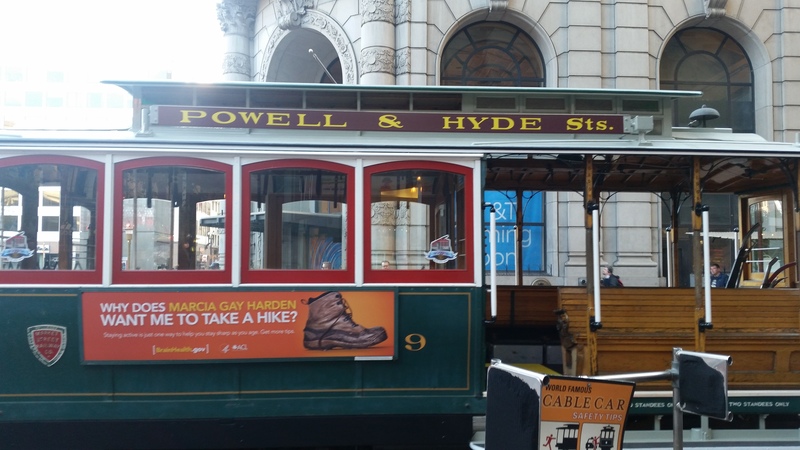 Cable Cars are not an efficient way to travel in the city, lines to board can be very long, and they do not cover the entire city. The price is a bit steep, 7.00 each time you board (unless you purchase an all day passport as we did). I am certain they can be extremely unsafe, I was told that people do fall off them from time to time. 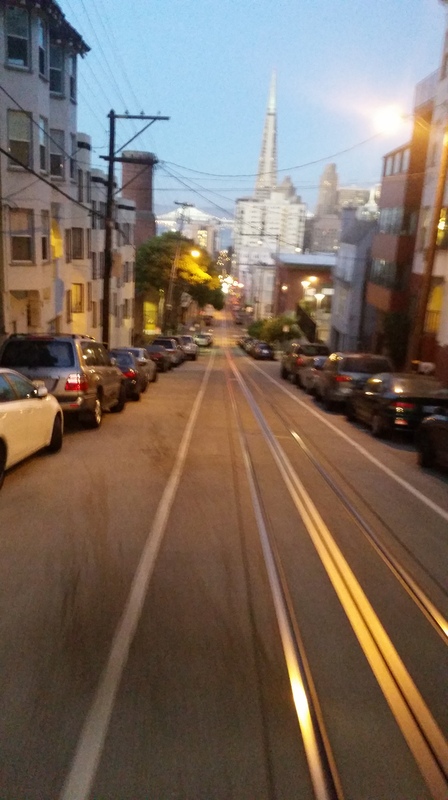 But none of those things matter to me, when I stood on the steps of that cable car, clinging to the poll I felt as if I was flying through San Francisco. I will check that off my list of things I want to do, but I won’t be erasing it. 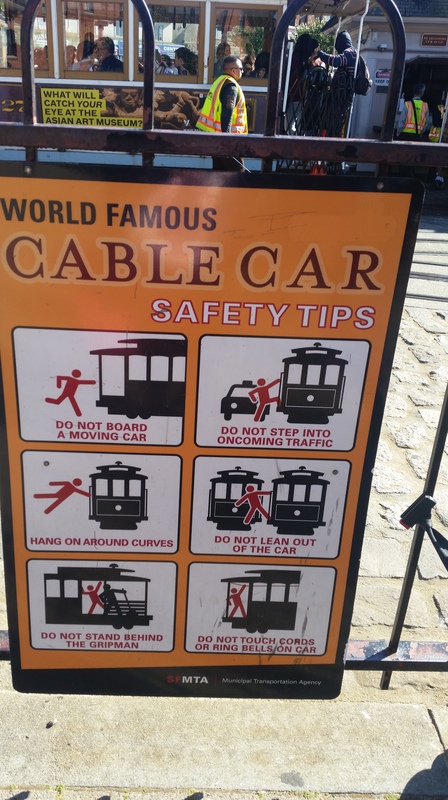 I am sure I will be dragging Don back on those beautiful cable cars every time I am in San Francisco for years to come. Everyone is talking about Pokemon Go, some good but a lot of poke-bashing which surprises me. We all complained when our children became hooked on TV, then chained indoors to controllers and joy sticks. Mesmerized by video screens playing computer generated games, where their only interaction with other humans was the voice on their headsets from fellow “gamers”. So along comes a game that not only encouraged children and adults to get outside but also encourages them to communicate with other people, in person! I have stopped and talked with several people out on Pokemon hunts about what they were finding and they were excited to share with me their most recent catches. In front of my hotel last night there was a large group of young people all talking and laughing with music playing in the background. This group that earlier had been strangers had come together drawn by the Pokemon lure in what appeared to be a mini Pokemon Woodstock. Come on guys, this is actually a great thing in my opinion, in a world of non personal text messaging and never leave the house mentality I love to see people outside talking to one another. Okay maybe it’s not perfect but it’s a step in the right direction. I personally would like to that those who invented this game for getting the world talking again and exploring the outdoors again, even if it for virtual imaginary characters! I won the Husband Lottery! I won the husband lottery, I don’t just say that because he gifts me gold on Delta every year and takes me to exotic NASCAR locations all over the county. No it’s so much more then that. Don is a keeper. People are always asking me what the secret of a good marriage is, I say it’s a combination of luck, commitment, friendship and poverty with poverty being a key element. 30 years ago when we started this journey together we were poor. Life was not easy but any time we considered separating or divorce we had to back away from it because we could barely afford to live together, living apart was not in the budget. 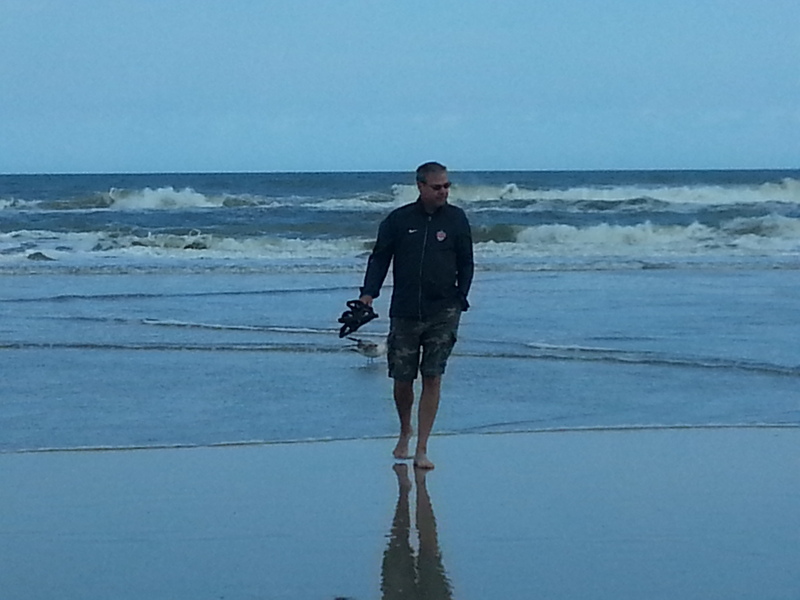 So on we trudged through babies, diapers, jobs, and all the other moments that you experience as a married couple. The old cliche what doesn’t kill you makes you stronger was true, though I think with us it was more like who doesn’t kill you makes you stronger, through our struggles we did become stronger. After 10 years of marriage and 3 children we found out that there had been a glitch with our wedding and in fact we were not really even married in the eyes of the church. In order to fix the glitch Don would have to get an annulment from his previous wife Susan, the process was lengthy and expensive not to mention a little embarrassing, Don had to call a woman he had not seen in more then 10 years to let her know their marriage needed to annulled, luckily she was good natured and willing to fill out the forms filled with relatively personal information and call on the witnesses that the church required. Our wonderful Parish Priest Msgr Brosnan knew the process was going to be a financial burden so he had the church take care of the expense. Both Don and Susan agreed there was something healing about the annulment process, even though their marriage had been brief both agreed it gave them a closure neither knew they needed. That year at Easter we stood before Msgr Brosnan to make our vows to one another once more. Just before our priest told each of us if you have any doubts this is the time to let me know. 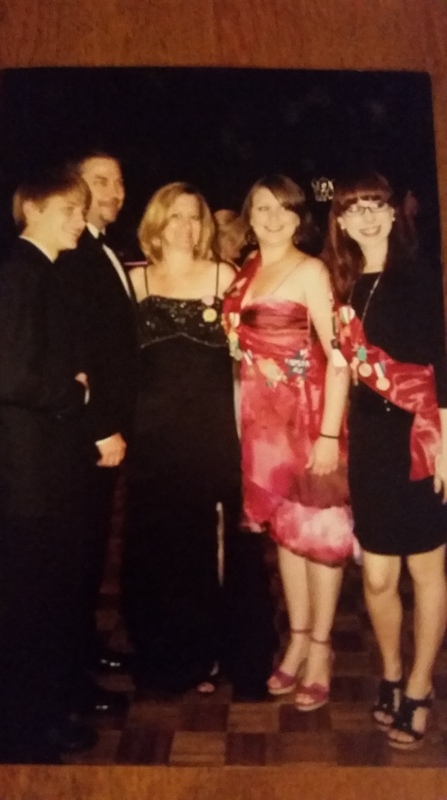 We looked at each other (and our 3 children) and knew that even in our roughest moments we would rather be together then apart. When we married the first time I heard our wedding vows but did not think about the true meaning, this time my eyes filled with tears as we repeated through richer and poorer, sickness and health, those words really meant something. I knew we would have our happily ever after but the journey was no fairy tale. This wedding was just us and 2 witnesses (Pam Mire and Diana Carpenter), no pictures or flowers, no honeymoon just our family saying yes it’s been tough but I would not trade a minute of it, and I’m ready to keep going. 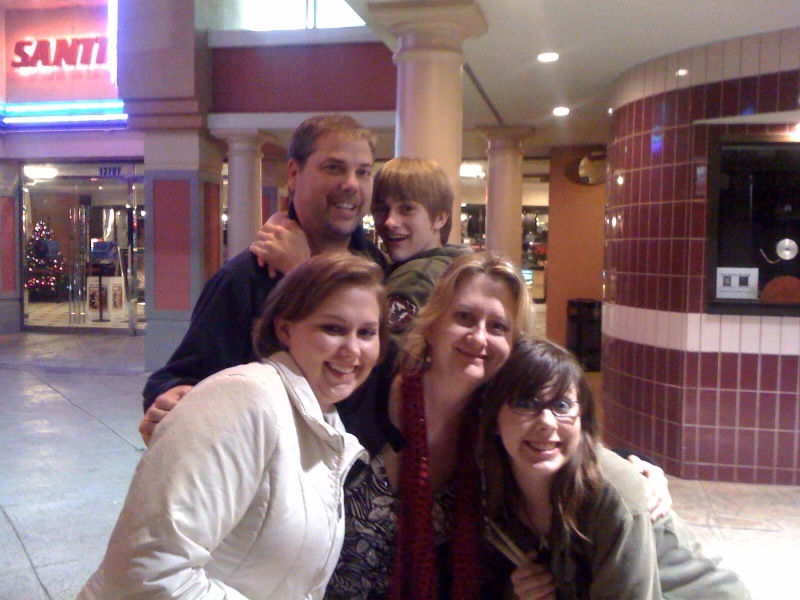 That was twenty years ago, our children have all grown up now. 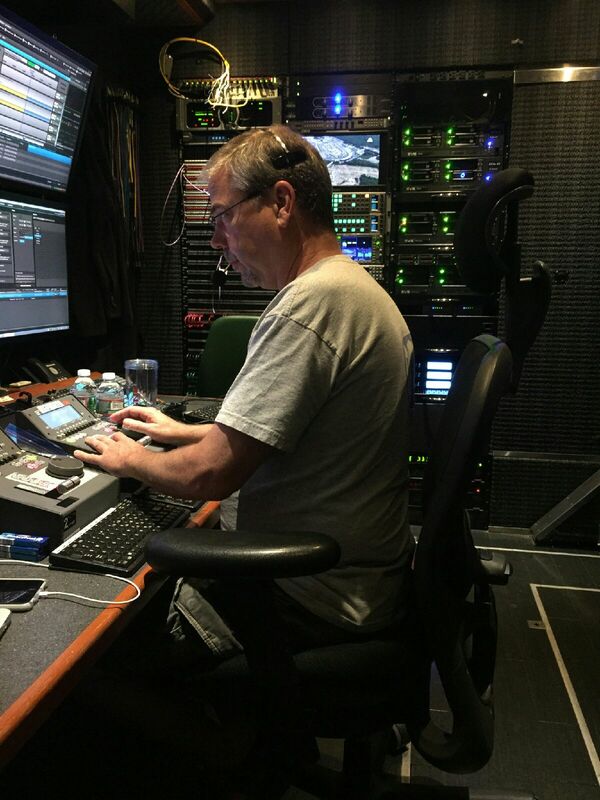 Don has a great job that keeps him on the road a good deal of the time. We are far from rich but I no longer lay awake at night worrying how we will pay our bills. Being apart so much helps us to value the precious time we have together. I am very fortunate to have a wonderful boss who has worked to allow me the be off part of the the time that Don is home, but even with my flexible schedule our time together is rare yet very treasured. When we got married we were in love, and I thought that love would make our lives perfect. We soon went through a phase where I felt like the couple in “Paradise By the Dashboard Light”. “If I have to spend another minute with you I don’t think that I can survive.” Somewhere in the middle we were like Golde and Teyve in Fiddler on the Roof asking ” Do you love me?” “For twenty-five years I’ve lived with him Fought him, starved with him Twenty-five years my bed is his if that’s not love, what is”? 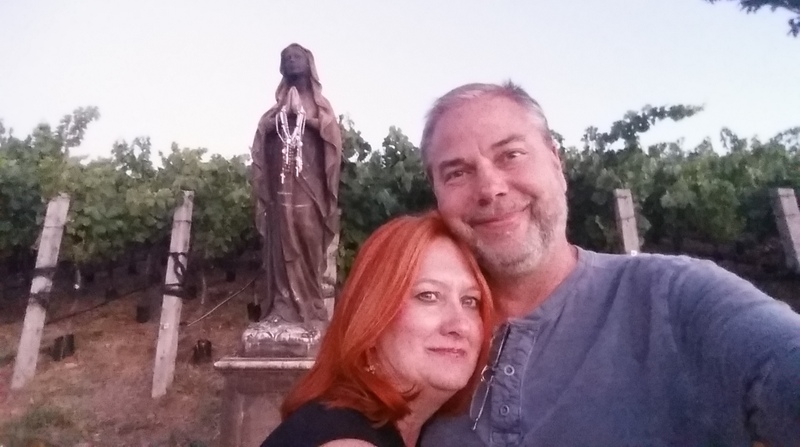 I won the husband lottery, and while that lottery did not include a big cash payout it gave me a life filled with more happiness, love and adventure then any amount of money could ever buy. Our life is far from perfect, but our love is perfect. Located in the beautiful Wayland Square, close to the home of author HP Lovecraft, The Red Stripe is a quaint restaurant and bar. While they do serve Red Stripe Beer (along with a large variety of other beers and spirits), the restaurant is not affiliated with Red Stripe Brewery in any way. The original proprietor was in a reggae band who spent time in Jamaica, hence the name. Our waiter Robert was helpful, knowledgable and patient with all our quirky, special orders and he made some great suggestions. We arrived in time to order from the lunch menu that offered a delicious Red Stripe Grilled Cheese with prosciutto, poached pear, basil pesto and cheese. My daughter and her boyfriend ordered the lobster roll with clam chowder that they split. I was impressed that they served two perfectly even plates with everything split down to 2 mini bowls of coleslaw. My daughter said it was the best clam chowder she ever had. Great service, delicious food great location, I can’t wait to return to Providence to check out more of their delicious menu in the future. If your in Austin and you love art check out the Hope Gallery. This is no ordinary gallery, you won’t find Picasso or Monet there but you will find some awesome modern art done by whomever brings chalk or a spray can and wants to express themselves. Some of the art is cute and fun, others are masterpieces. It’s amazing to me that there are so many talented artist out there, I love that they have a way to express their creativity in such a public setting. There is no fee to come here, it is open air and with all the cement it can get pretty hot in the summer. Getting to some areas can be tricky as the ground is uneven and there are multiple levels, but there is plenty to see towards the bottom. Putting stairs in would be a great Eagle Scout project and would help make all the artwork more accessible. I loved this fun, quirky art gallery. What I did not love was the amount of litter left by visitors and artists. The area was cluttered with empty spray cans, water bottles and other garbage. Clean up after yourselves people, no one would leave that kind of mess if they walked into the Louvre. This would be a great afternoon outing in the fall or spring, and you can visit often as the landscape is constantly changing. Keep that weird creativity Austin, it’s places like this that keep you great. If there was a time machine that allowed us to travel to any place or time we desired, one of my choices would be San Francisco in 1967. Hippies dancing in the streets, peaceful protesters terrified of the war raging around them, a generation hoping to change the world with love, peace, LSD, and a new, radical sound that would forever change the face of music. 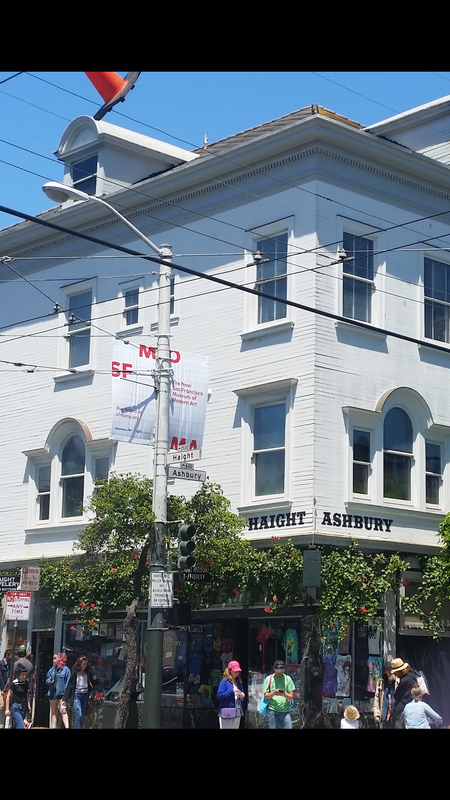 Sadly I don’t have a time machine, but I was able to travel to San Francisco and visit Haight-Ashbury this summer. 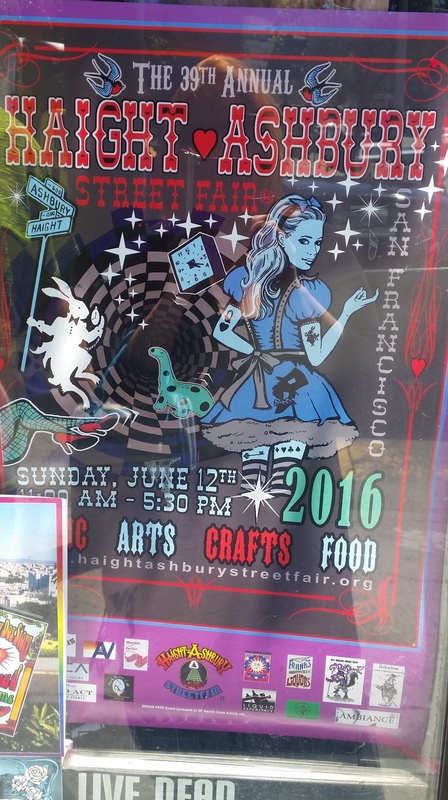 Haight and Ashbury are 2 streets that intersect in San Francisco giving name to the district of Haight-Ashbury. Though you can still find much of the hippie look in the area, it seems to be more of a manufactured touristy feel. Walking through the neighborhood, we were approached by Greenpeace members, but even these guys didn’t have the passion you would have expected from someone in that magical area, they gave us a short speech about loving the earth before pulling out their iPads and asking us to give them our credit cards to become members. We stopped and had great cheeseburgers and dark beer at Magnolia Gastropub and brewery. They still brew beer in the basement like they have since 1997. Around us were people in their 30’s looking very corporate and business like with their computers open, taking care of business while eating. Tour buses drove up and down the streets telling the story of how the area became a Mecca for thousands of young people in 1967. Many searching for mind enhancing experiences and a culture that could belong to their lost generation. 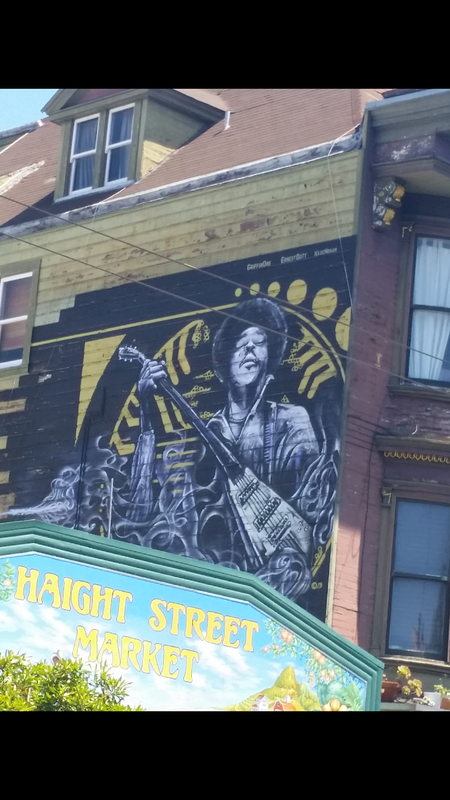 The neighborhood has done what it can to bring back that ’67 vibe of the area, but there were no flower children dancing in the streets, no one was publicly smoking, shooting or dropping, and not one single musician played in the streets. I wondered if the spirits of hippies past still roam the streets, disappointed that their once cultural nirvana is now run by the establishment. “Don’t let the man keep you down”. There is irony in the fact that the generation who worked so hard to rid the world of the establishment gave birth to the generation of a whole new corporate America and .com. 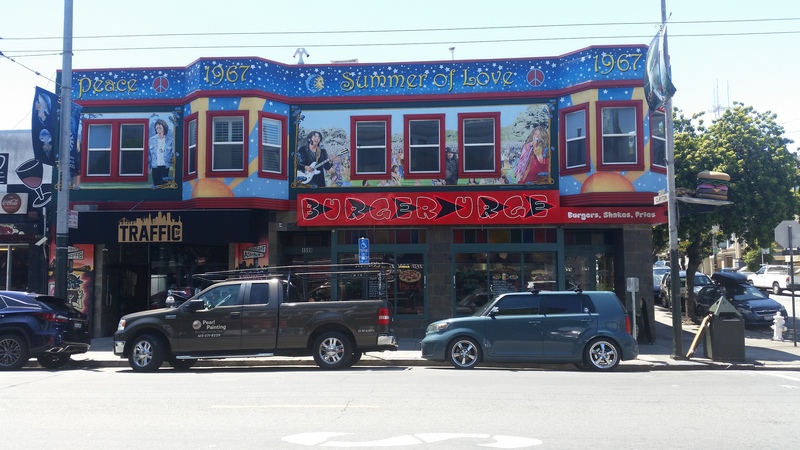 Haight – Ashbury may no longer be a Mecca for the generation of peace and love, but being there was still a reminder of The Summer of Love, and the brilliant creative young people who converged into San Francisco and forever changed the world, and now own it.